I've been stuck riding my rollers the majority of the week (and last week and the week before). I ride my Fixed Gear Surly Steamroller on it and have gotten rather comfortable while on it. My roller sessions are a mix of long tempo rides or short but intense intervals. This week in particular I've added some INSANITY works outs in the mix too. Mornings I do Insanity and at night I ride the rollers. Needless to say, I'm tired and sore. So this Saturday I had it in my mind to do an easy short ride. Just enough riding to feel good. A relaxed ride. I wasn't sure where I was going to go, but i had it in my mind I would stop off somewhere for coffee as well. Because I've been riding the Steamroller on the roller so much, I've developed a fondness for it and a longing to take it on some real paved roads. The Steamroller deserves some asphalt, rather than cold aluminum rollers! So I headed out with the Steamroller, and by either fate, or divine direction or something else, I found myself at the base Glendora Mountain Road. I guess the Steamroller wants a challenge. 46 x 15 fixed and heading up, I set a goal of the first saddle. The first saddle would be just enough. Just enough to keep my legs fresh for the downhill. You see riding fixed gear you literally ride every inch, every mile, the pedals never stop turning. Bombing down GMR you can easily reach speeds of 30 plus miles. According to Sheldon Brown's Gear Calculator, at 120 rpm, I would be doing 28 mph. So at an uncomfortable 140 rpm or more, I'd be hitting +30 mph. That's an insane spin! 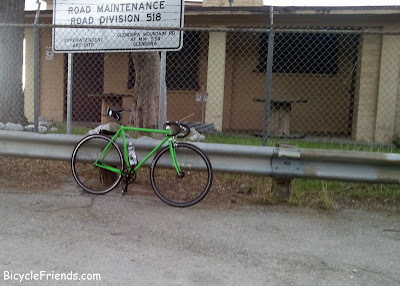 I made it to the first saddle and thought, "shoot, I made it this far, might as well ride to the maintenance shed." So I pressed on and slowly made my way to the maintenance shed. Once I made my way to the shed, I felt like I accomplished something special. I was happy. On the way up, the thought of bombing down GMR played over and over in my mind. Going up was the "Easy" part. But how...how would I fair on the downhill. How would I negotiate the turns, the speed and the spin? Luckily, I did have a front brake setup, but would a front brake alone be enough? Different thoughts and scenarios ran though my mind. Would I have to call someone to pick me up? If I made it down on one piece, would I have enough energy to get home? It was cold at the shed so I didn't stick around too long. I wanted to keep my legs warm. How horrible would it be to cramp on the ride down! Well here I go. I headed down, trying to keep my legs loose. One thing I learned from my FG friends online is when bombing downhill and you feel out of control to pedal faster! Don't resist, go with the bike. Amazingly this helps. Heading down GMR you pick up speed quickly, so I let the bike go and when I felt like I was going too fast, I applied my front brake just enough to bring me back. Back to the edge if crazy! I made it down! I was jazzed! I made it down safely, WOOHOO! Boy am I tired. Ugh, now for the trek home. It was a slow ride home, I was tired yet very pleased. I think I will definitely try it again, maybe a few times and then set a goal for Mt Baldy (Although I am not sure about the ride down Mt Baldy on a Fixed Gear).